OHP is proud to announce the addition of Thuricide® N/G Biological Insecticide to its portfolio of biosolutions. 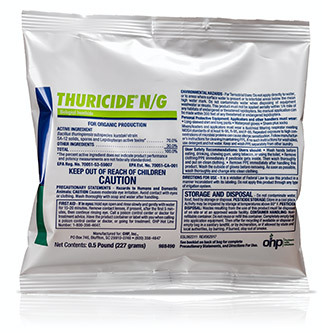 Thuricide N/G, derived from a naturally-occurring bacteria, infects lepidopteran larvae and other insect larvae. Thuricide N/G contains the bacteria bacillus thuringiensis subspecies kurstaki strain SA-12. The product is the latest of several additions to the OHP biosolutions segment of new tools and proven solutions for crops grown in greenhouses, nurseries, and the landscape— including vegetables and herbs. Thuricide N/G is approved for organic production and is OMRI listed. After a Thuricide N/G application, insect larvae consume the bacteria. Once in the insect gut (stomach) the cryotoxins are released causing the larvae to stop feeding and subsequently die within a few days. Use of Thuricide N/G fits well into a pest control program utilizing beneficial insects or predators, notes Dr. Carlos Bográn, OHP Technical Manager. Dr. Bográn notes Thuricide N/G should be used at the first sign of pest infestations for optimal results and in a rotation with products from different classes with different modes of action. Thuricide N/G carries a 4-hour Restricted Entry Interval (REI) and Caution signal word. OHP, Inc. is a leading marketer of pest control solutions for the greenhouse and nursery market. More information on OHP biosolutions and Thuricide N/G may be found here. OHP Inc. is proud to announce the addition of Astun™ Ornamental Fungicide to its stable of pest and disease solutions for the greenhouse and nursery markets. Astun provides outstanding botrytis control with the active ingredient isofetamid, a new fourth-generation member of the SDHI class of chemistry, mode of action (MOA) group 7. “Astun provides preventative, systemic, and curative activity on ornamentals grown in commercial greenhouses and nurseries”, notes Dr. Carlos Bográn, OHP manager of technical services. “Astun is most effective when used as a protectant fungicide applied when conditions are right for botrytis development but before the disease damages the crop,” says Dr. Bográn. Formulated as a user-friendly Suspension Concentrate (SC), Astun provides growers a new tool for botrytis resistance management. Astun can be tank mixed with other partners for a broader spectrum of control. Astun carries a 12-hour REI and Caution signal word. More information on Astun including label, SDS and product information can be found here. September 25, 2017, Bluffton, SC.— OHP, Inc. announced today that it is selling substantially all of its assets to AMVAC Chemical Corporation, Newport Beach, CA. The closing is anticipated to occur in early October. OHP is a leading supplier of chemical and biological pesticide solutions specifically packaged and labelled for the for the greenhouse and nursery production markets and sold through a network of leading distribution partners throughout the United States and Puerto Rico. OHP was founded in 1988 by Ronald Soldo and has dedicated itself to fulfilling the pest control needs of the production ornamental market. In its 30-year history, OHP has grown to hold a leading position in the greenhouse and nursery pest control market. “After so many years of involvement in this industry, I am confident that AMVAC represents an ideal owner to foster and grow the OHP business well into the future” says Ron Soldo, CEO of OHP, Inc.
OHP will continue to operate as it has in the past and there will be no changes to staff, products, customers or operations. AMVAC will operate the business as a wholly owned subsidiary under the name of OHP, Inc. Dan Stahl will continue on as General Manager reporting directly to Bob Trogele, AMVAC COO. “We are very pleased to now be a part of AMVAC,” says Dan Stahl, GM of OHP. “The cultural fit, resources and business development approach of AMVAC will create tremendous opportunities for growth. I am truly excited to be a part of the AMVAC leadership team and look forward to continuing the future growth of the OHP business,” adds Stahl. “We are extremely excited to have OHP be a part of AMVAC,” says AMVAC COO Bob Trogele. “The reputation and quality of the entire OHP team is remarkable. The entrepreneurial culture, business model and strategy are very similar to the way we operate at AMVAC so it is a great fit. They will continue to operate as they always have in providing a broad range of value-added products and service to commercial greenhouses and nurseries. The leading position OHP has built will be a great complement to our growing turf, ornamental and pest control business,” adds Trogele. Vanguard Corporation is a diversified speciality and agricultural products company that develops and markets products for crop protection and management, turf and ornamentals management and public and animal health. American Vanguard is included on the Russell 2000® and Russell 3000® Indexes and the Standard & Poor’s Small Cap 600 Index. To learn more about American Vanguard, please reference the Company’s website at american-vanguard.com. OHP proudly announces the introduction of “OHP biosolutions” to better serve the greenhouse and nursery market including vegetables and herbs. This new line from OHP will feature products that are specifically designed to address the expanding segment of growers who utilize biological products exclusively or in combination with conventional products. “We see the steady evolution of our industry from one where conventional products were dominant to one where growers are using all available options,” notes Dan Stahl, OHP vice president and general manager. “Our motto has been ‘OHP, your partner with solutions.’ Now, with biosolutions, we’ve broadened our approach to include non-conventional products for the diversity of growers we see today,” adds Stahl. OHP will soon add insecticides, fungicides, and specialty products that are mostly compatible with vegetable crops and herbs grown in media or in hydroponic situations, notes Stahl. The upcoming biosolutions products from OHP, mainly comprised of reduced risk products, will be compatible with beneficial insects, and pollinators. Most of the products will also be compatible with organic production. Many of the new products will carry short Restricted Entry Intervals (REI) of 4 hours and require minimal Personal Protective Equipment (PPE). With the expanded product offerings, in addition to the current OHP legacy products, OHP solidifies its position as the leading supplier of pest management tools and solutions for the greenhouse and nursery market. The initial product introductions are scheduled for early 2017. OHP’s popular Plant Growth Regulator (PGR) Calculator app has been redesigned from the ground up. The new version, PGR Calculator v2.1, contains many of the same features as the previous version now runs faster and works on all iOS device environments. “OHP consistently provides excellent support in a variety of different ways and the new PGR Calculator demonstrates our dedicated commitment at the grower level“, says Ryan Boehm, manager of marketing services and developer of the PGR Calculator. 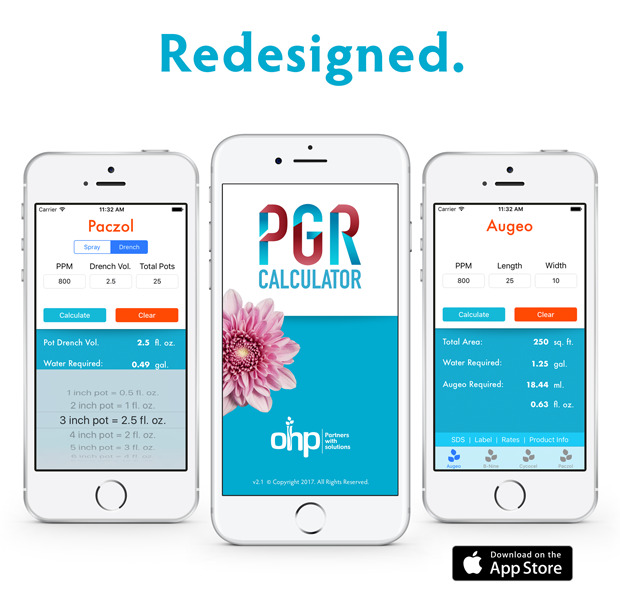 You can find the new PGR Calculator on your iOS device by clicking on the “App Store” icon and searching for “PGR Calculator.” You can also download it directly by clicking here. Visit the OHP team at American Takki during the upcoming California Spring Trials and see the new PGR Calculator on display.